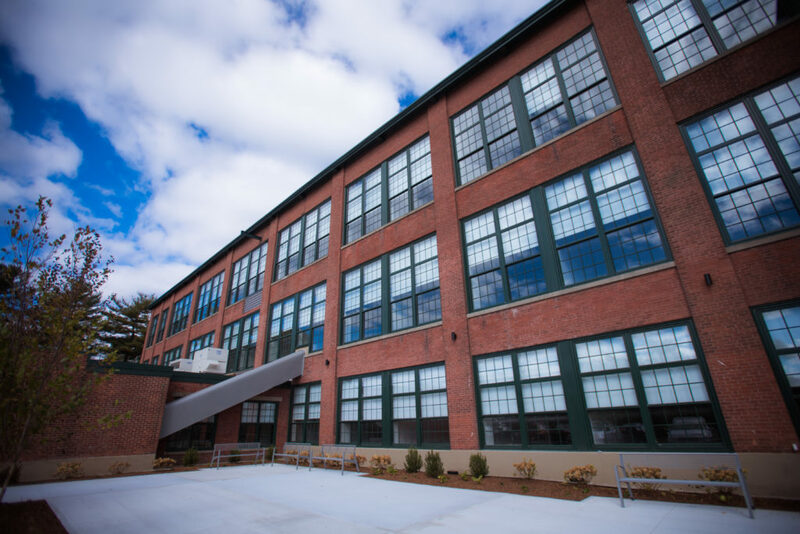 More than three years after its inception by Trinity, the former Imperial Knife Company building in Olneyville is seeing a new life through the opening of our 60 King project. The redevelopment of 60 King is the second housing project contemplated in the Build Olneyville Plan, a holistic, community-based vision for improving the Olneyville neighborhood and the nearby Manton Heights public housing development. 60 King includes 54 affordable rental units at 30% and 60% of area median income, as well as six market-rate apartments. On October 30th, a sunny and crisp fall day, we were joined by Governor Raimondo, U.S. Senator Reed, Congressmen Langevin and Cicilline, Mayor Elorza, and our partners at RIHousing, ONE Neighborhood Builders, SWAP, and Citizens Bank to celebrate bringing modern and mixed-income housing to this neighborhood of Providence. The ribbon cutting ceremony was filled with excitement and enthusiasm as this project, which began construction in the spring of 2017, was finally completed. 60 King is Trinity’s first project in Providence. Starting in the 1950s, the 60 King building was home to the Imperial Knife Company, founded by brothers Felix and Michael Mirando, and financially backed and managed by their friend, Domenic Fazzano. One of the country’s largest manufacturers of pocket knives at the time, the Imperial Knife factory provided thousands of jobs in the area for many decades. We were honored to have members of the Fazzano family join us for this celebration. 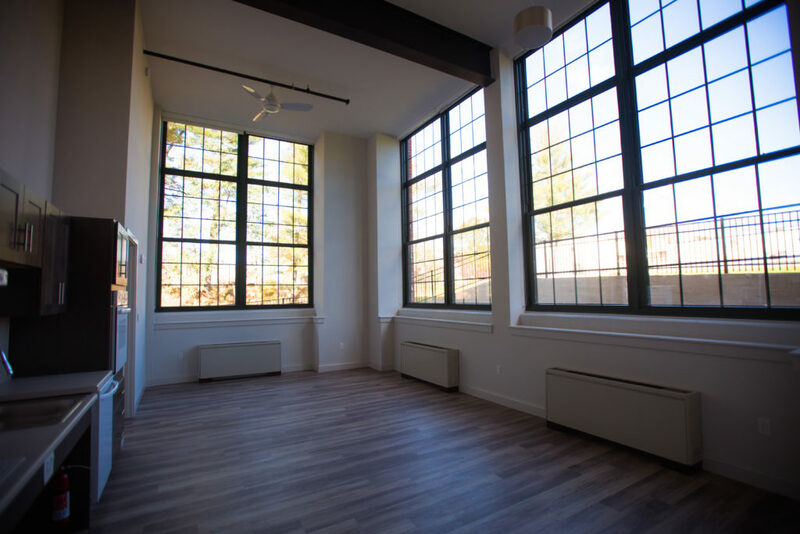 The redevelopment of 60 King is a testament to how repurposing a historic space that once provided jobs can now provide safe and affordable homes to the community. The large windows and high ceilings in the units provide views to the Woonasquatucket bike path and walking trail adjacent to the building. Open floor plans and amenity spaces, such as the children’s indoor playroom and fitness center, offer opportunities for creating a sense of community. We look forward to seeing the families of 60 King make use of this adaptively reused space and add new vibrancy to this corner of Providence. 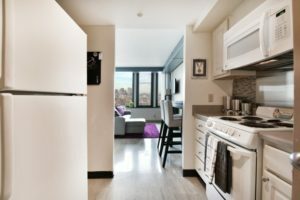 Check out all that 60 King has to offer its new residents here. Washington Village is the oldest public housing site in Connecticut and experienced significant damage and flooding during Superstorm Sandy in 2012. Over the past few years, Trinity and the Norwalk Housing Authority have worked with the residents and local and state agencies to develop a plan to replace the housing on site with a design for the new buildings that pairs style with sustainability and flood resiliency. When completed, this revitalization will replace the existing Washington Village with 273 new, safe, modern apartments, including a one-for-one replacement of the 136 public housing units that existed there at the start of construction. On the afternoon of Wednesday, October 24, we gathered with dozens of our partners, community members and elected officials, including Gov. Dan Malloy, U.S. Representative Jim Himes and Norwalk Mayor Harry Rilling, to celebrate an important milestone in our redevelopment of Norwalk’s Washington Village – the completion of Phase One and the start of Phase Two! Now at the close of Phase One, there are 80 new thoughtfully modern apartment homes at 13 and 20 Day Street. The revitalization of this community started with the search for a new name. We worked with the NHA and polled the Washington Village residents to select a name, and when the votes were tallied, the winner was clear: Soundview Landing. This name pays homage to the City of Norwalk’s maritime history and the beautiful views of the Long Island Sound. 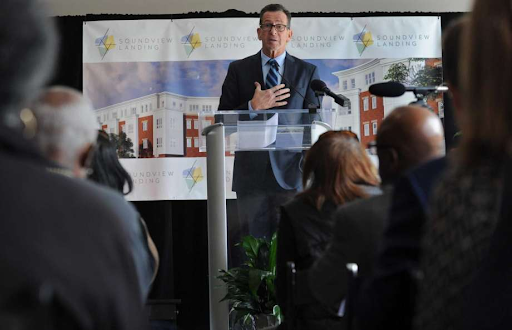 At the ribbon cutting, Governor Malloy told the crowd, “Housing is fundamental to who we are and how we raise our children. We need a broader brush of affordable housing through our state.” At Trinity, we could not agree more. We are proud to now be able to share Phase One with the South Norwalk community, and also look forward to the completion of the whole project! Phase One is now complete and leasing and the entire site will be complete in 2022. Check out the new website to learn more about Soundview Landing! At the core of all Trinity projects are the community, its residents, and a belief that having access to high-quality housing results in a stronger urban fabric. To see a clear example of this, one needs to look no further than East Boston’s Overlook Terrace at Orient Heights. 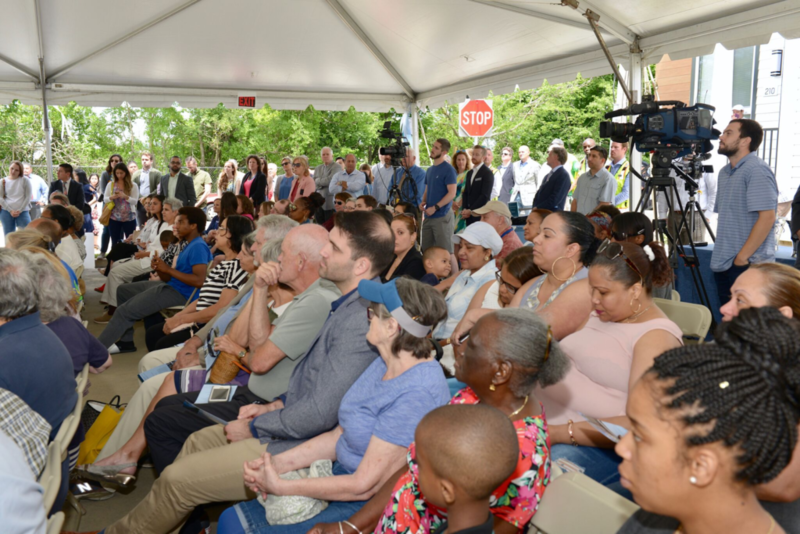 This summer, we marked an exciting milestone at the Orient Heights development. 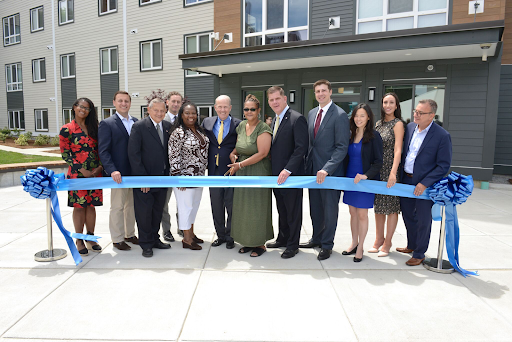 Joined with residents, the Local Tenant Organization and elected officials, we celebrated the completion of the first phase of redevelopment, which brought 120 units of newly constructed, modern, LEED Platinum Certifiable affordable rental housing to the East Boston community. Orient Heights, a public housing development, was originally built in 1951 and has been owned and managed by the Boston Housing Authority. The dated property sorely needed improvements to provide residents with quality housing within a healthier, more vibrant living environment. We were selected, along with the East Boston CDC, to bring this transformation to life. To help determine what this transformation would consist of, we met with the residents and the broader neighborhood to understand the needs and desires of the community. As we cut the ribbon to celebrate the completion of this first phase, MassHousing Executive Director Chrystal Kornegay reminded us all that, “We always remember what we do this for – at the end of the day it’s about the residents and we all know that and keep our eyes on the prize.” This is something we take to heart at Trinity, as we always work to develop communities that enhance the quality of life for residents and the surrounding neighborhood. Like most of our projects, the Overlook Terrace at Orient Heights revitalization is a collaborative effort between both public and private partners, and we were proud to stand alongside many of them at the ribbon cutting. 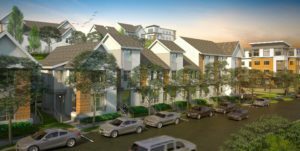 Phase Two of construction is now underway, and will consist of 88 rental units in a combination of townhouse and mid-rise buildings, as well as new and improved open spaces. We’re hoping for a smooth construction phase and are as eager as the residents to fulfill the vision of a renewed community in this Orient Heights neighborhood! Lowell, Massachusetts has a proud history as the birthplace of the Industrial Revolution, and is looking to continue its legacy as a critical innovation district. Nowhere is this juxtaposition of old and new innovation more apparent than our latest project in Lowell’s Hamilton Canal District. We worked to redevelop 110 Canal Street, a former mill building, into a 55,000-square-foot spec office and commercial property. 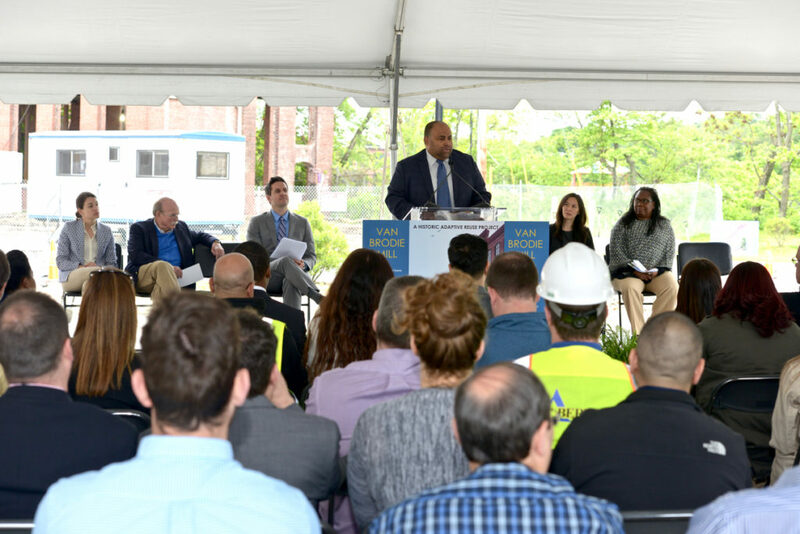 This certified historic rehabilitation project is an integral part of the broader mission to revitalize this district, and follows the completion of our redevelopment of Appleton Mills, the largest affordable artist housing development in the state. 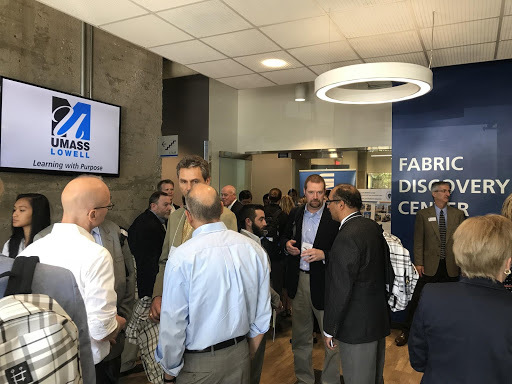 UMass Lowell’s NERVE Center and Fabric Discovery Center, which offers a location for companies and university faculty to work together to design and test advanced manufacturing. The UMass Lowell Innovation Hub, which fosters entrepreneurship, economic development and job creation by linking the region’s technology startups and entrepreneurs to resources that facilitate the development, manufacturing and commercialization of their respective innovations. The hub hosts technology-focused startup companies based on university technology, as well as innovations and concepts developed in the larger, entrepreneurial community. M2D2, a business incubator which provides space for early-stage medical device and biotech businesses. 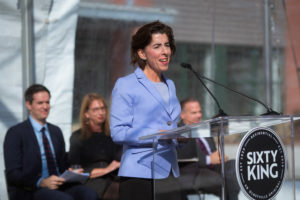 We recently had the opportunity to come together to celebrate the official opening of this building with Governor Charlie Baker, leaders from UMass Lowell, national manufacturing institutes and the Massachusetts advanced manufacturing community. As Lowell continues to be a hub for innovation, we know that 110 Canal Street will be an important part of this story. We look forward to seeing the entrepreneurial and creative spirit that has revitalized this former mill building and hope it will extend beyond the building itself and into the entire city. On the morning of June 6th, we gathered in Lawrence with elected officials and our partners to break ground on our newest redevelopment: Van Brodie Mill. This adaptive reuse of a former mill that was originally built in 1919 is our first project in Lawrence, and will preserve an historic structure while remediating a brownfields site, ultimately bringing 102 units of mixed-income housing to the Arlington Mills Historic District. 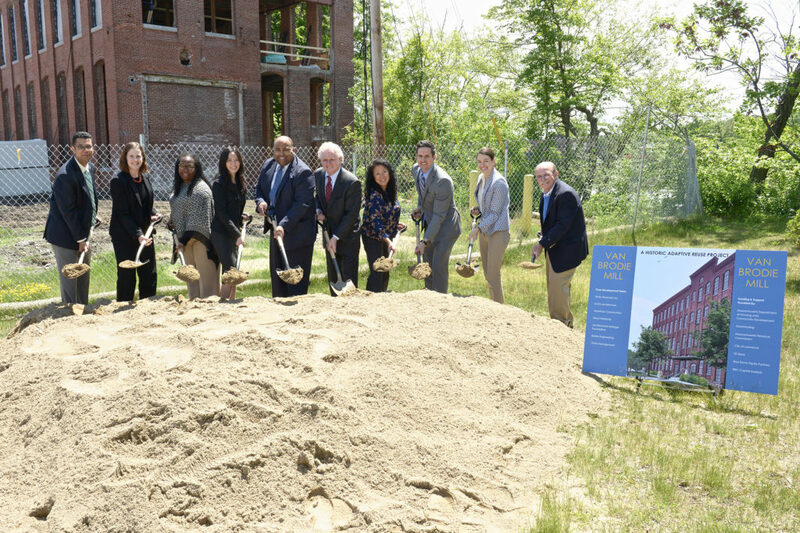 The groundbreaking featured an array of speakers, including Department of Housing and Community Development Undersecretary Janelle Chan; Lawrence Mayor Dan Rivera; State Representative Frank Moran; and MassHousing Executive Director Chrystal Kornegay, a nod to the collaboration amongst our partners at the state and local level in transforming this historic property into much-needed housing. Van Brodie Mill will be built on four adjacent land parcels within the city’s 34-acre Arlington Mills Smart Growth Overlay District, containing two interconnected mill buildings with 100 units; a small, former incinerator building with two units; a water pump house, and a parking lot. 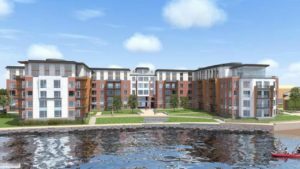 The completed project will contain eight studio apartments, 25 one-bedroom apartments, 56 two-bedroom apartments and 13 three-bedroom apartments. 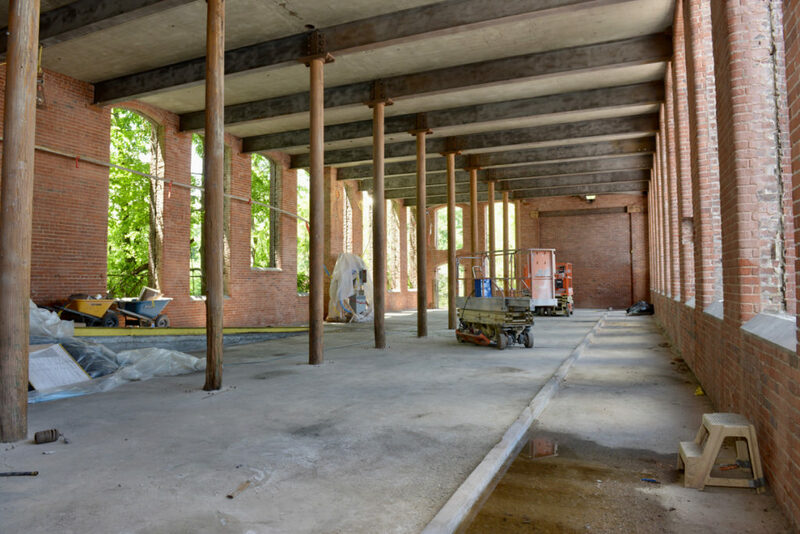 While Van Brodie Mill may be Trinity’s first project in Lawrence, it is not our first foray into brownfield remediation, a process which we are also undertaking in the redevelopment of our 60 King building in Providence, which was once the site of the Imperial Knife Factory. Construction started in January 2018 and is estimated to take approximately 18 months. We’re looking forward to opening our doors to the Lawrence community in the fall of 2019! 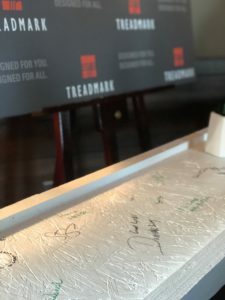 On April 23, 2018, we joined together with partners, friends and the Ashmont/Peabody Square community to celebrate the topping-off of Treadmark 2.0. 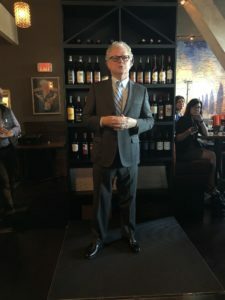 The milestone event, held across the street from the building at Tavolo Ristorante, celebrated the rebuild of the structure and roof just 10 months after a fire destroyed the original construction. 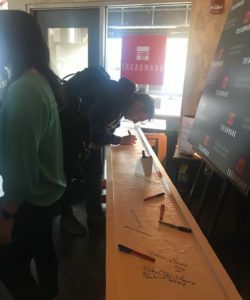 On hand at Tavolo were about 90 supporters of the project, including architects, builders, local retailers, neighbors, and future residents, who all signed a beam and raised a glass together to mark the halfway point of construction on the transit-oriented development in Ashmont/Peabody Square. In total, Treadmark will bring 83 new units of housing and ground floor retail with space for American Provisions, a locally-run artisanal grocer which will provide delicious options and new jobs for the Dorchester community. Jim Keefe, our principal, took time to thank Treadmark’s supporters and those committed to seeing the project rebuilt, saying that “as we rise from the ashes, people I don’t know tell me on the street how happy they are to see this building rising again. We’re not done yet, but we are celebrating today because it looks like a real building. The next part of our job is turning this building into people’s homes.” From Jim and our whole team at Trinity, we were, and are, so grateful to take the next step towards completing Treadmark 2.0, and we’re looking forward to November 2018 when construction is expected to be finished. 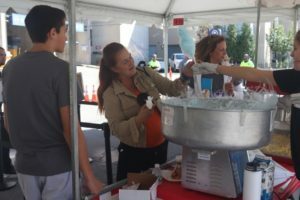 Take a look at the thoughtful column that ran on the event, written by the Dorchester Reporter’s Bill Forry. Few areas in Boston have experienced rapid growth quite the way that East Boston has. 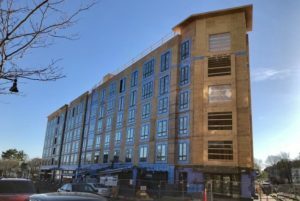 In the past few years alone, cranes have sprouted up across the neighborhood, reflecting the demand for housing and development close to downtown Boston and accessibility to Boston public transit. The cranes have been accompanied by a ripple effect of new restaurants, businesses and cultural destinations headed to Eastie, including an announcement from the ICA earlier this spring that they will open a new outpost on the East Boston waterfront. There’s no doubt about it – Eastie is hot! But years before other developers began visiting East Boston in droves, Trinity was already there, committed to creating transformative projects that would play a pivotal role in the evolution of Eastie. Trinity Financial’s work in East Boston began over a decade ago with Maverick Landing. In 2001, the Boston Housing Authority was awarded a $35 million HOPE VI award for the complete renovation of Maverick Gardens, a deteriorating public housing complex on the Eastie waterfront. With the partnership of the East Boston Community Development Corporation (EBCDC), we transformed the site, demolishing all 413 units and replacing them with 396 units in newly constructed buildings including 20 townhouses, six six-story mid-rise buildings, and a community center. The final result? 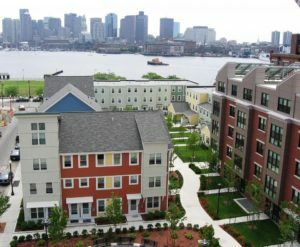 A new, mixed-income community called Maverick Landing, designed to provide a new corridor to Boston Harbor and reconnect Maverick to the rest of the East Boston community. 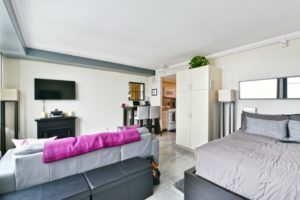 Located conveniently near the Maverick MBTA stop, residents also have easy access to downtown Boston and the surrounding areas. A short distance away from Maverick Landing on the Eastie waterfront sits Boston East, our newest development in the neighborhood. In 2006, Trinity and the EBCDC were designated developer by the City of Boston on this blighted parcel of land on Border Street. After years of working through complicated design challenges, complex waterfront permitting hurdles and the turbulence of the 2008 recession, Trinity was able to begin construction on the project in 2015. Located between the Central Square and Maverick MBTA stations, we were able to transform what was once an industrial site into 200 breathtaking rental apartments, including six artist live-work apartments. Residents will be able to benefit from unique amenities like a kayak and paddle board launch; a yard with grills and a fire pit, a dog spa, a Hubway dock and Zipcar spots on-site. Additionally, there is a dedicated space for artists, an open gallery space celebrating the neighborhood’s arts and culture providing ample opportunities for the community to come together for art exhibitions and community events. Currently leasing, we can’t wait for Boston East to open in early 2018 so the community can experience all that it has to offer. Trinity’s presence in East Boston extends beyond the waterfront, too. 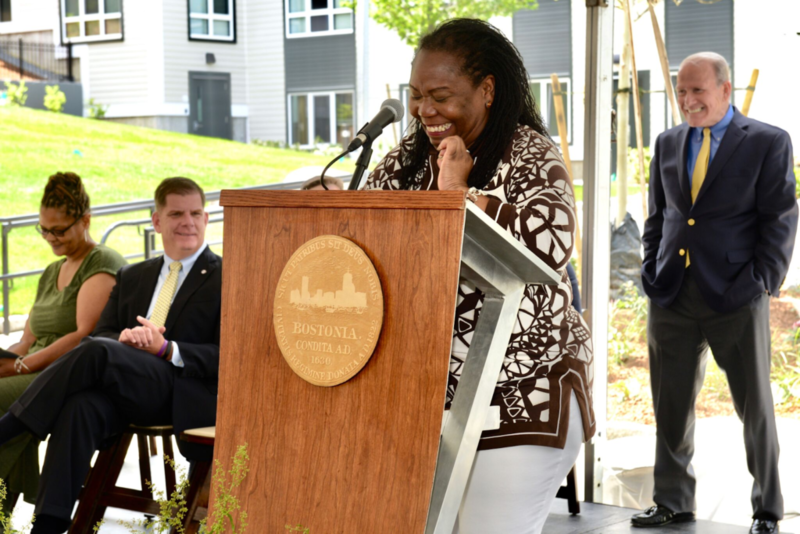 Just last year we broke ground with the Boston Housing Authority and EBCDC at the Boston Housing Authority’s Orient Heights development, located in the hills of East Boston’s Orient Heights neighborhood. Built in 1951, Orient Heights is a 15-acre site comprised of 331 units of state-funded public housing, a community center and a central boiler plant, all terraced into a steep hillside and in great need of maintenance and modernization. Through multiple phases, this project will redevelop the entire Orient Heights development, yielding 373 units of new, beautiful housing, 331 of which will be replacement units. At Trinity Financial, we’re proud to have been part of the East Boston landscape for years. 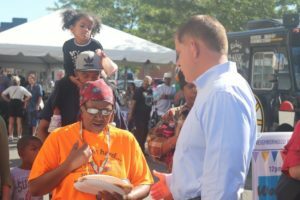 While development in Eastie shows no signs of slowing down, we’re committed to continuing to look for sites- as we did in Maverick, Boston East and Orient Heights – where we can introduce transformative development that reflects the wants and needs of the community so that East Boston can thrive. 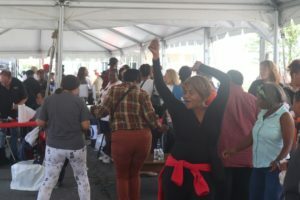 On Saturday, September 23, hundreds of residents and neighbors of the Northampton Square Campus, which bridges the Lower Roxbury and South End communities, joined together for a community block party to celebrate the newly renovated 35@EightSixty. With Northampton Street blocked off to car traffic for the day, community members, families and children of all ages enjoyed music, dancing, live art from Artists for Humanity and other artists, games and free food. 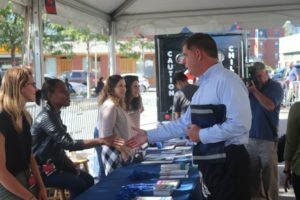 The Boston Public Health Commission, Boston Medical Center, and Hope House were also on-hand, providing information and resources for members of the community. 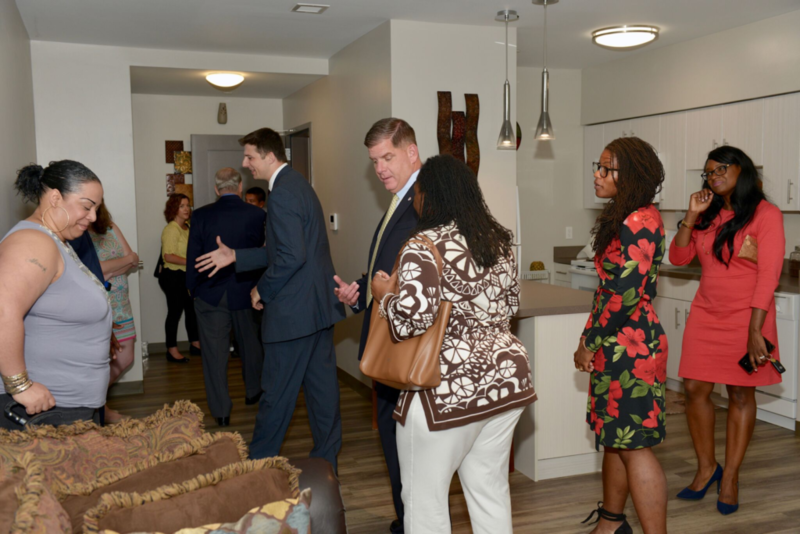 Boston Mayor Martin J. Walsh was among the crowd of community members who attended the block party, stopping to talk with residents and neighbors and learn more about the renovation work done at 35@EightSixty. 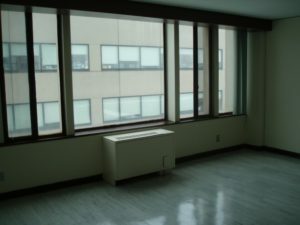 Built between 1969 and 1973 to house the Boston City Hospital School of Nursing, the City of Boston and Boston Public Health Commission procured our team in 2010 to modernize components of the Campus that were in desperate need of capital repairs. The residential apartments at the Campus were suffering from decades of deferred maintenance, and the physical condition was jeopardizing the ability to continue providing this important housing resource in this neighborhood. 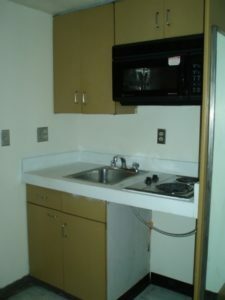 Renovations to the two towers, which began in 2013 and completed in 2016, included upgraded kitchens, renovated bathrooms, low-flow plumbing fixtures, and energy efficient windows with new blinds in all units – and all of this work was completed while residents continued to live in their apartments. The modernization project also included new mechanical and electrical systems, façade repairs and improvements, a new roof, elevator upgrades, new laundry rooms, and improved security systems. As a part of our work at this development, the 347 apartments in the two residential towers, 35 Northampton and 860 Harrison, are now deed-restricted affordable apartments. It was a beautiful day surrounded by our friends and the community at 35@EightSixty. 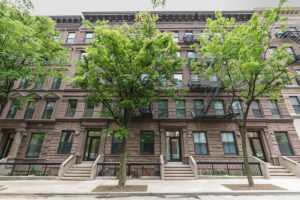 The first phase of the Randolph Houses project successfully rehabilitated 22 of the 36 five story Old Law tenement buildings that make up the development. Once slated for demolition due to its deteriorating state, Trinity took on the Randolph Houses project, along with partners West Harlem Group Assistance and NYCHA, to execute on the historic rehabilitation of the existing structures into two sets of interconnected and fully handicap-accessible buildings. The building facades have been restored and now feature repaired brownstone, limestone and brick, as well as new cast-iron window surrounds, new windows and doors. The interiors of the buildings have been completely demolished and rehabilitated into 168 units of affordable and public housing, along with community spaces. The reconfigured 168 units are a mix of studio, one-, two-, three- and four bedroom apartments designed to accommodate family living. 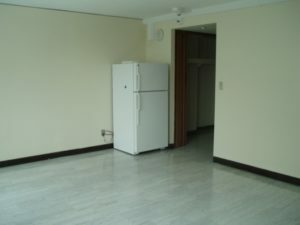 The rehabilitated buildings contain community space, computer lab, fitness room and storage for residents. There are also site improvements which include two children’s play areas for different age groups and active and passive outdoor spaces for residents to enjoy. We strongly believe in preserving the architectural integrity of the neighborhoods we work in while creating a positive change for all residents. Trinity, along with our partners from West Harlem Group Assistance and NYCHA, is honored to receive this award. Thank you, New York Landmarks Conservancy, for including Randolph Houses among your 2017 winners! Mixed-income housing has been a growing trend in real estate over the past decade, spurred both by community needs and by developers looking to distinguish their projects from the field. But the process of building mixed-income developments is not as straight forward as sprinkling affordable units into a new market-rate development. These types of projects are complicated requiring complex financial structuring, careful planning and strategic location selection. So why do it? Last winter, I spoke on a panel at ABX 2016 where I was joined by Angie Liou, Executive Director of Asian Community Development Corporation and Andre Leroux Executive Director – Massachusetts Smart Growth Alliance. During the panel, I shared insights about our Enterprise Center development in Brockton, MA, discussing the challenges and importance of building mixed-income housing in smart locations. When Trinity Financial first looked at Brockton, MA as a location to invest in, the city was at the beginning of its renaissance. 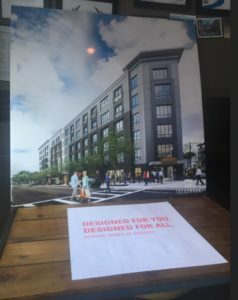 While market conditions were not yet strong enough to support a fully market-rate development downtown, elected officials and stakeholders expressed a need for more market-rate housing, fearing that exclusively developing affordable units would prevent the type of economic development necessary to spur Brockton’s emerging downtown. So what made us decide that Brockton would be a smart site to develop mixed-income housing? Brockton had two of the most important ingredients – the right physical location, and dedicated and involved stakeholders. 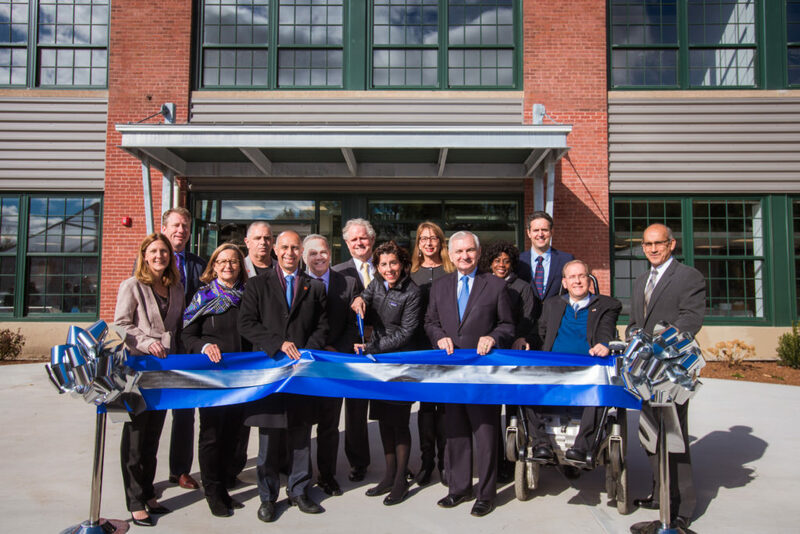 First, the Enterprise Center is transit-oriented, located within close proximity to the MBTA Commuter Rail system as well as the Brockton Area Transit bus system, ensuring residents will be well-connected to the surrounding community. 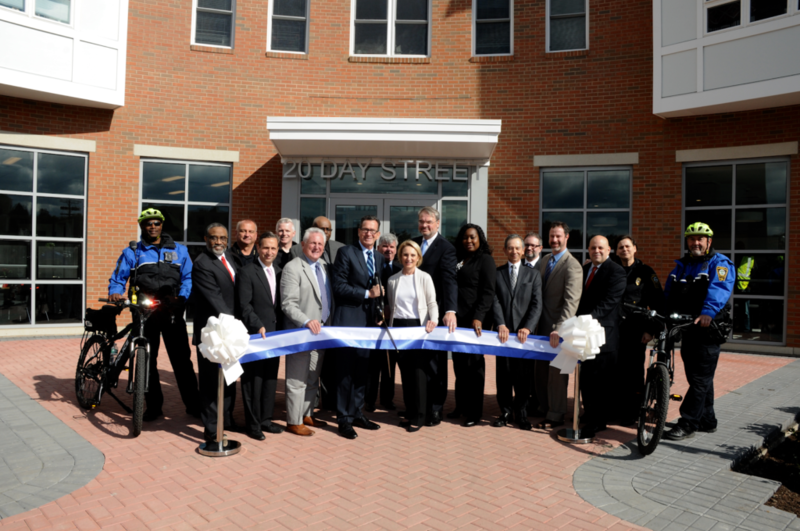 Because of the existing infrastructure in downtown Brockton, we were confident that the city would be able to accommodate the new development, physically and economically. 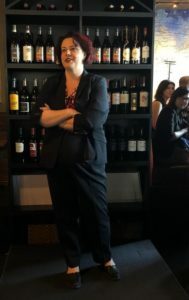 But ensuring that the project would come to fruition required a strong coalition, including Brockton stakeholders such as: local elected officials, municipal employees, members of the downtown business community and of course, the Trinity team , aligning with a shared mission to benefit the Brockton community at large. With the right location and team, we were able to transform a parcel of land that generated no revenue into a fully taxable property, providing an economic stimulus through development that will help revitalize Brockton. A rising tide floats all boats and as downtown Brockton strengthens, it will continue to encourage more development, making Brockton a smart city for future mixed-income and mixed-use developments. In 2015, we completed Phase 1 of the Enterprise Center, creating 113 total housing units, including 42 market rate, 29 affordable and 42 artist preference units. 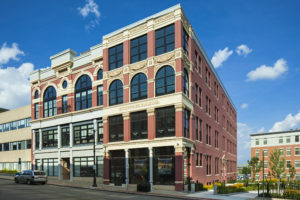 Along with 52,000 square feet of commercial/office space, 10,000 square feet of retail and artist exhibition space, 95 residential parking garage spaces and 185 surface parking lot spaces, the Enterprise Center is now a successful development that Trinity Financial is proud to have as a part of our portfolio. But that’s not all – we are looking forward to beginning Phase 2 later this year! For more information on Enterprise Center click here. For more information on Trinity Financial visit our website or follow us on Twitter at @Trinity_RE. TRINITY FINANCIAL GETS UNDERWAY WITH COURTHOUSE PROJECT; HOW DID THINGS GO IN LOWELL? © Copyright 2006-2016 Trinity Financial LLC. All rights reserved.